Home » Tech » What Is Li-Fi ? Li-Fi is the branding name of a "post Wi-Fi" technology, that can be a complement of RF communication (Wi-Fi or Cellular network), or a replacement in contexts of data broadcasting. Li-Fi can be also bidirectional, like Wi-Fi, as a high speed and fully networked subset of visible light communications (VLC). It is wireless and uses visible light communication (instead of radio frequency waves), that is part of the Optical Wireless Communications technologies, which carries much more information, and has been proposed as a solution to the RF-bandwidth limitations. A complete solution includes a standardization process, as proposed by the Li-Fi Consortium. It is a 5G visible light communication system that uses light from light-emitting diodes (LEDs) as a medium to deliver networked, mobile, high-speed communication in a similar manner as Wi-Fi. Li-Fi could lead to the Internet of Things, which is everything electronic being connected to the internet, with the LED lights on the electronics being used as Li-Fi internet access points. The Li-Fi market is projected to have a compound annual growth rate of 82% from 2013 to 2018 and to be worth over $6 billion per year by 2018. Visible light communications (VLC) work by switching bulbs on and off within nanoseconds, which is too quickly to be noticed by the human eye. Although Li-Fi bulbs would have to be kept on to transmit data, the bulbs could be dimmed to the point that they were not visible to humans and yet still functional. The light waves cannot penetrate walls, which make a much shorter range, though more secure from hacking, relative to Wi-Fi. Direct line of sight isn't necessary for Li-Fi to transmit a signal; light reflected off the walls can achieve 70 Mbit/s. Li-Fi has the advantage of being useful in electromagnetic sensitive areas such as in aircraft cabins, hospitals and nuclear power plants without causing electromagnetic interference.Both Wi-Fi and Li-Fi transmits data over the electromagnetic spectrum, but whereas WI-Fi utilizes radio waves, Li-Fi uses visible light. While the US Federal Communications Commission has warned of a potential spectrum crisis because Wi-Fi is close to full capacity, Li-Fi has almost no limitations on capacity.The visible light spectrum is 10,000 times larger than the entire radio frequency spectrum. Researchers have reached data rates of over 10 Gbit/s, which is more than 250 times faster than superfast broadband.Li-Fi is expected to be ten times cheaper than we-Fi, Short range, low reliability and high installation costs are the potential downsides. Pure Li-Fi demonstrated the first commercially available Li-Fi system, the 1st, at the 2014 Mobile World Congress in Barcelona. 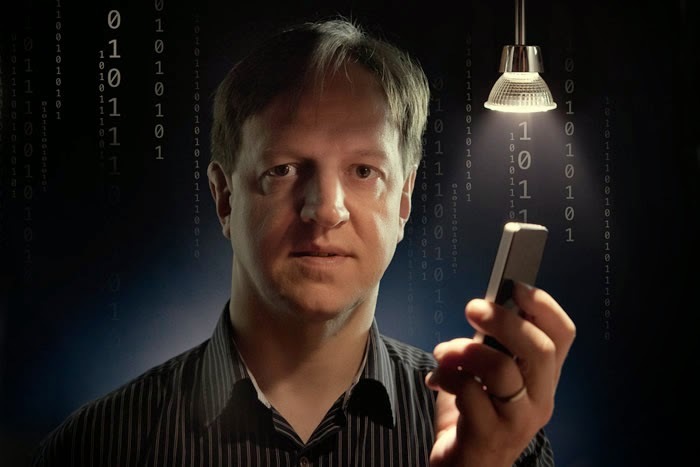 Professor Harald Haas, from the University of Edinburgh in the UK, is widely recognized as the original founder of Li-Fi. He coined the term Li-Fi and is Chair of Mobile Communications at the University of Edinburgh and co-founder of pureLiFi. The general term visible light communication (VLC), includes any use of the visible light portion of the electromagnetic spectrum to transmit information. The D-Light project at Edinburgh's Institute for Digital Communications was funded from January 2010 to January 2012.Haas promoted this technology in his 2011 TED Global talk and helped start a company to market it. PureLiFi, formerly pureVLC, is an original equipment manufacturer (OEM) firm set up to commercialize Li-Fi products for integration with existing LED-lighting systems. In October 2011, companies and industry groups formed the Li-Fi Consortium, to promote high-speed optical wireless systems and to overcome the limited amount of radio-based wireless spectrum available by exploiting a completely different part of the electromagnetic spectrum.A number of companies offer uni-directional VLC products which is not the same as Li-Fi. VLC technology was exhibited in 2012 using Li-Fi. By August 2013, data rates of over 1.6 Gbit/s were demonstrated over a single color LED. On September 2013, a press release said that Li-Fi, or VLC systems in general, do not require line-of-sight conditions. In October 2013, it was reported Chinese manufacturers were working with Li-Fi development kits. In April of 2014, the Russian company Stins Coman announced the development of a Li-Fi wireless local network called BeamCaster. Their current module transfers data at 1.25 gigabytes per second, but foresee boosting speeds up to 5 GB/second in the near future. Like Wi-Fi, LiFi is wireless and uses similar 802.11 protocols; but it uses a visible light communication (instead of radio frequency waves), which has much-wider bandwidth..
One part of VLC is modeled after communication protocols established by the IEEE 802 Workgroup. However, the IEEE 802.15.7 standard is out-of-date. Specifically, the standard fails to consider the latest technological developments in the field of optical wireless communications, specifically with the introduction of optical orthogonal frequency-division multiplexing (O-OFDM) modulation methods which have been optimized for data rates, multiple-access and energy efficiency.The introduction of O-OFDM means that a new drive for standardization of optical wireless communications is required. Nonetheless, the IEEE 802.15.7 standard defines the physical layer (PHY) and media access control (MAC) layer. The standard is able to deliver enough data rates to transmit audio, video and multimedia services. It takes into account optical transmission mobility, its compatibility with artificial lighting present in infrastructures, and the interference which may be generated by ambient lighting. The MAC layer permits using the link with the other layers as with the TCP/IP protocol. The PHY I was established for outdoor application and works from 11.67 kbit/s to 267.6 kbit/s. The PHY II layer permits reaching data rates from 1.25 Mbit/s to 96 Mbit/s. The PHY III is used for many emissions sources with a particular modulation method called color shift keying (CSK). PHY III can deliver rates from 12 Mbit/s to 96 Mbit/s. The modulation formats recognized for PHY I and PHY II are on-off keying (OOK) and variable pulse position modulation (VPPM). The Manchester coding used for the PHY I and PHY II layers includes the clock inside the transmitted data by representing a logic 0 with an OOK symbol "01" and a logic 1 with an OOK symbol "10", all with a DC component. The DC component avoids light extinction in case of an extended run of logic 0's. The first VLC smartphone prototype was presented at the Consumer Electronics Show in Las Vegas from January 7–10 in 2014. The phone uses SunPartner's Wysips CONNECT, a technique that converts light waves into usable energy, making the phone capable of receiving and decoding signals without drawing on its battery. A clear, thin layer of crystal glass can be added to small screens like watches and smartphones that make them solar powered. Smartphones could gain 15% more battery life during a typical day. This first smartphone using this technology should arrive in 2015. This screen can also receive VLC signals as well as the smartphone camera.The cost of these screens per smartphone is between $2 and $3, much cheaper than most new technology. VLC technology is ready right now; it's being installed in museums and businesses across France, and is being embraced by EDF, one of the nation's largest utilities.